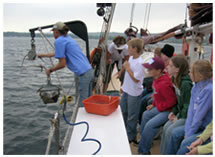 The mission of the Inland Seas Education Association of Suttons Bay, Michigan is to use shipboard and onshore experiential educational programs to inspire young people to pursue academic interests related to the Great Lakes, particularly the sciences, and enhance public understanding and stewardship of the Great Lakes and global freshwater systems. American Steamship Company's Community Partnerships Program sponsored a Great Lakes Schoolship Program during September 2007 for 61 fifth grade students from the Alpena Public Schools to study Great Lakes science and heritage through formal classroom instruction and practical experience aboard the schooner Inland Seas. The Parkside Community Association's Summer Arts Program has provided creative programming for over two hundred children who come from throughout the City of Buffalo to attend this increasingly popular camp. The children get a chance to explore their creativity in art, writing, theater, pottery and music, using a special summer arts theme as their guide. 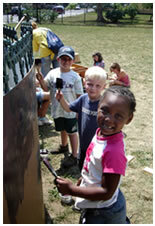 The 2007 summer program entitled "Exploring the Great Lakes", gave the children an opportunity to learn about ecology, marine life, and the important role that shipping has played in Buffalo's history. This summer's activities even included the con- struction of a Great Lakes freighter. American Steamship Company was proud to support this worthwhile program in both 2006 and 2007.